Located on the northern-most tip of Japan’s main island, Aomori is a great location for people who love winter sports. In fact, Aomori City gets the most snowfall of any Japanese city! Life in Aomori City isn’t just skiing and snowboarding. The prefecture of Aomori is famous for apples, seafood, and sake. There is even a building next to Aomori Station called A-Factory where visitors can try apple cider making and enjoy regional delicacies while taking in the beautiful sight of Aomori Bay Bridge. 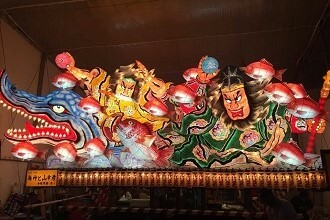 In the summer, Aomori is home to one of the most famous festivals in Japan, the Aomori Nebuta Matsuri. From August 2-7, you can watch beautifully decorated and lit-up floats being carried through the city streets. During the rest of the year, you can experience the festival by visiting the Nebuta Museum Wa Rasse near Aomori Station. In addition, Aomori has many beautiful temples, baths, museums, and other historical sights. For more information about schools in AEON’s Tobu area click here. How did you make friends when you first came to Japan? The thing about Japan is there’s no shortage of people to meet. You tend to stand out because you’re foreign, so it’s quite easy to start a conversation (in English) once you learn how to speak to low level speakers. If you want to make an effort and take advantage of new experiences, which is probably the reason you came to Japan, try out your Japanese. Most mistakes are forgiven because your foreign, though, so it might not make for the best improvement if no-one picks out your mistakes. There’s a little island off the shore of Hiroshima called ‘Miyajima’. It’s the most serene part of Japan I have visited. We arrived after a very emotional previous day visiting Peace Park in central Hiroshima. I was a little bit sick after my hotel had an open bar party the previous evening, but the fresh sea air and delicious seafood made for a quick recovery. Stepping off the barge, all there was were quiet surroundings, a few businesses and a beautiful shore with a background of a forest moving up a mountain. There were a few deer scattered around the parks and many little eateries and souvenir shops. Walking along the esplanade, there were traditional lanterns even spaced parallel to the shore. I could only imagine how beautiful this place would look at night as I was only allowed a half day to explore. Further along were two huge dog-lion statues that, I could only assume, were supposed to guard the Utsukushima shrine. As we made our way further along the road turned inland, but from the shore, you could see the torii-gate a traditional structure found at the foreground of all Shinto shrines. Through the temple there were many sake barrels and people seated on a platform raised above the water just watching the shrine. There was a long street market behind the shrine leading back to the boat. As we left, I thought that I have to make this trip again.